The Paul Bunyan State Trail lies parallel to TH 371 as it enters Pine River MN which has a 2013 population of 934. 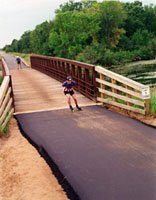 There is virtually no visual or physical separation between the Paul Bunyan trail and this major highway for its entire one mile length through the city. Most development, including the central business district and the major residential area, is located to the northeast of this trail-highway corridor. Newer commercial development is occurring along the northeast side of TH 371, and consists of auto dealers, service stations, fast food businesses, motels, and a limited amount of industry. The adjacent central business district is at a right angle to the trail and highway, and contains all of the usual services that a trail user might need. In addition to a variety of stores, restaurants, and commercial services, the community has a medical clinic. The Pine River Chamber Information Center is now operating alongside the Paul Bunyan Trail and offers full restroom situation, free water, free Wi-Fi, vehicle parking, bike racks & fix-it station. We are also an Explore Minnesota Affiliate Info Center which means we handle all Explore MN information materials. Pine River also has a tent camping park which bikes use a lot for overnights. Restrooms open days seven days a week. Book Your Paul Bunyan Trail Hotel in Pine River MN! Mile 30.0 Pine River trail access/parking lot.